Lawrence & Associates > Blog > Personal Injury > What Does My Car Insurance Cover? Everyone in Kentucky is required to have a minimum of $25,000 in liability automobile insurance by state law. Despite that common knowledge, very few Northern Kentucky drivers seem to have a good understanding of exactly what their insurance policy covers, and why it is a good idea to buy more than the bare minimum. In this post, your local Northern Kentucky personal injury attorneys will briefly explain what the different types of coverage within your automobile policy mean, and how they can help you. Remember that the words in your full insurance policy matter. The policy is a contract between you and an insurance company such as State Farm, or Allstate. While the Kentucky statutory system is the outline for the contract, and sets the minimum duties for the insurance company, the policy is what fills in all the details. Therefore, for specific information about your rights under your insurance policy, always start by getting a copy of the policy itself. What is Liability Coverage, and How Is It Different from Full or Collision Coverage? When Kentucky law requires you to have $25,000.00 in automobile insurance coverage, that refers to liability coverage. Liability coverage does two things in the event that you cause a car accident: first, it requires the insurance company to provide a lawyer for you, generally free of charge, and; second, it requires the insurance company to pay up to the liability policy limit toward the other driver’s damages. Many Northern Kentucky drivers are confused about the attorney requirement, and try to hire a lawyer to defend themselves after a car wreck. This is not necessary, so don’t waste your money! Liability Coverage does not require your insurance company to cover your damages, regardless of who caused the car wreck. PIP coverage does (more on that below), but this is why getting liability coverage only is generally a bad idea. Yes, it is nice to save money each month, but if a car accident occurs, you will be completely out of a car! It’s worth a little more each month to make sure the damage to your vehicle is covered. We’ve previously written about PIP coverage, how PIP coverage applies to medical bills, and how PIP can affect your right to file a lawsuit. In short, this is one of the most important and most misunderstood parts of the typical Kentucky automobile insurance policy. PIP is commonly referred to as no-fault benefits, and Kentucky is commonly referred to as a no-fault state. Our clients often confuse these terms to mean that they cannot recover money from another driver in Kentucky, even if the other driver is at fault, because they believe “no-fault” means that it doesn’t matter who is at fault. This is not true! PIP benefits are used to cover your medical bills and a portion of your lost wages – regardless of whether or not you were at fault for the automobile accident – but they do not take away your ability to sue for your damages if the other driver is responsible. Please follow the links to our other blog posts on PIP for more information, and remember: PIP is cheap and you may want to buy more than the state minimum of $10,000. Most insurance companies will sell policies with up to $50,000 of PIP. How are UM Benefits and UIM Benefits Different? UM stands for Uninsured Motorist Coverage, and UIM stands for Uninsured Motorist Coverage. Uninsured Motorist Coverage applies when the other driver was at fault for the wreck, but did not have any insurance coverage. It stands in the place of the liability coverage that the other driver should have had, and covers injuries or damages you have related to the accident. UM coverage applies in hit-and-run situations. Underinsured Motorist Coverage is additional coverage for you if the other driver was at fault and you have injuries or damages that require more money than the upper limit of the other driver’s policy can provide. Typically, the UIM portion of your policy will kick in only after you have finished getting money from the other driver’s liability policy. Usually, UIM and UM coverage is fixed at the same amount as your liability coverage. Raising limits for UM and UIM coverage along with the liability coverage helps protect you in the event of a crash. While UM and UIM generally cost more than PIP, consider raising these limits if you can! How are Collision, Comprehensive, and Full Coverage Different? There is no such thing as “full coverage.” This simply refers to a policy that combines liability coverage with collision. Collision coverage covers the physical damage to your vehicle in the event of a wreck. Comprehensive coverage covers physical damage to your vehicle even if there was no wreck involved. Insurance policies are contracts, and lawyers know contracts. An experienced personal injury attorney can look at your insurance policy and tell you what your policy will cover in the event of a car accident. 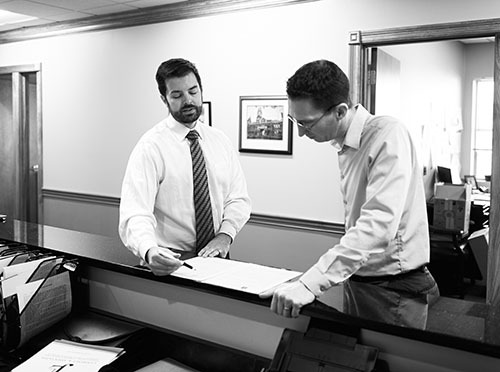 We help Northern Kentucky car accident victims every day. If you have questions about your insurance policy, please call today! Lawrence & Associates is Working Hard for the Working Class, and we want to work for you!